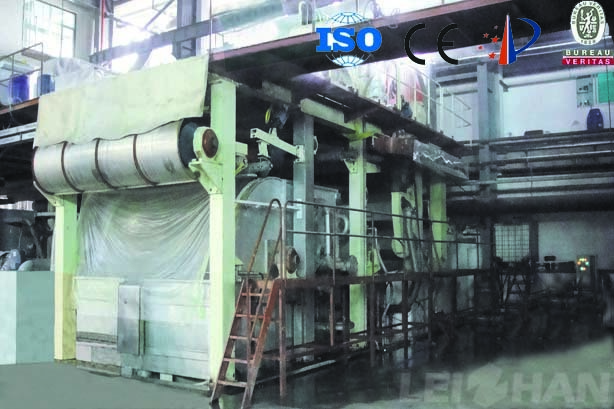 Inverse pulp cylinder mould tissue paper machine is mainly used to produce tissue paper. The paper machine is divided into several parts: net groove, cylinder mould part, press part, drying part and reeling part. Square cone pipe pulp inlet, movable curved plate pulp machine, control and stabilize the pulp speed and concentration by adjusting and controlling pulp inlet pressure and curved plate aperture of inlet pipe. One cylinder mould, main parts: couch roll, back roll and frame and so on. Carrier roller press equip with one covered rubber metal roll, which includes guide felt roll, felt suction box and a felt. The idler roll press’s pressure method is corrugated tire pressure. 4. Drying part: Φ3000/Φ3600 dryer cylinder, individual drive and equip with closed type hot blast air hood, a wrinkle scraper and a clean scraper. Pressured way is air cylinder pressure.